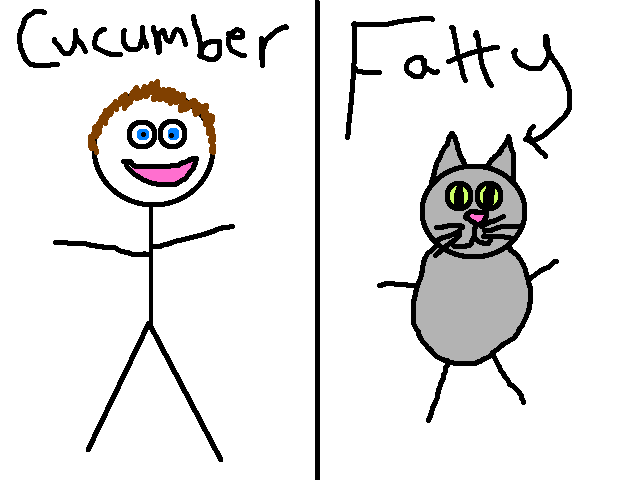 I am starting to think that The Cool Cucumber and Fatty might actually be the same person/cat. Why, you ask, would I be confused at whether my toddler son and my obese cat are the same person? Well, the similarities between the two are uncanny (or uncatty, if you will). They both howl in agony when you take their milk away. They both have no sense of personal space. Though they have their own personal method of getting all up in your grill, Fatty prefers to sit on my neck while The Cucumber prefers my lap, both Fatty and The Cucumber will always make sure you are without personal space. Ever. They both like to watch me in the bathroom, both of them are usually under foot when I am making dinner and they both are somehow attached to me from the time I wake up to the time I go to sleep. Fatty doesn't even let me do that alone. They both love food more than anything in the world. Dear sweet baby Jesus do these two love food. They would both eat until food came out of their eye holes or they suffocated to death on chocolate pudding. It is both disgusting and fascinating how much this dynamic duo can cram down their gullets. And expensive. And did I mention disgusting? They both sound like Darth Vader having an asthma attack. When The Cucumber and Fatty breathe, it sounds like a plastic bag being sucked into a vacuum cleaner. And not just after they have both finished a rousing game of flashlight tag. They sound like that all. the. time. Try sitting on the couch and trying to enjoy a movie with the mesothelioma twins at your side. Not fun. They both find the grass greener on the other side. If they stand at the door and beg to go play outside, they will be happy for about two seconds once you let them out there. They will then stand on the other side of the door and beg to be let back inside. Wash. Rinse. Repeat. They both loved to have their bellies rubbed. Seriously. Both of them. All. Day. Long. They both sleep more than seems humanly/catly possible. Of the 24 hours that are in a day, both Fatty and The Cool Cucumber sleep over half of them. They love sleep. Love it. It is like they actually live to sleep. And they are both equally awesome at it. A dump truck could drive through a nitroglycerine plant next door and they would open one eye to investigate, decide it isn't worth getting up for and go back to dreaming about tuna fish and pancakes. Assholes. Thank goodness for little boys.